DEPENDAPOWER Submersible Pump - SOS Safety International Inc.
Williams Fire & Hazard Control provides various options and customizations, such as noise reducing enclosures, solar charging, intake and discharging manifolds, transport modes, and lighting, to meet your unique requirements for specific applications. World Class Components – Superior performance, quality, and reliability help ensure worry-free operation to maximize return on investment. Enhanced Safety – Advanced filtration of the hydraulic system limits contaminants reaching the reservoir and damaging other equipment in the system. Biodegradable hydraulic fluid is used to minimize environmental impact. Ease of Use – Digital controls are designed to provide a simple and intuitive interface utilizing sophisticated sensors and controls. Quick disconnect couplings of hydraulic lines and hose lines on the floating submersible unit. 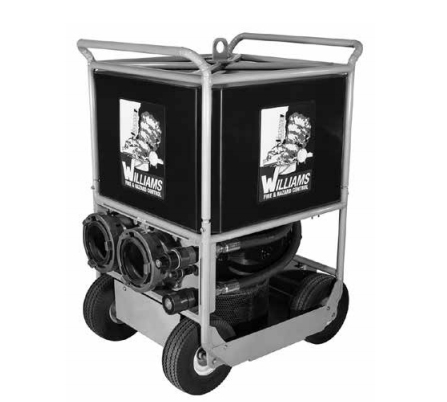 Powered hydraulic hose reels for easy layout and rewind. Minimum training and low maintenance required. Redundant system controls help ensure a primary control system failure will not render the unit inoperable and allow easy training of operating personnel. Modular Compact Design – Powerful pumping system in a portable configuration with enhanced mobility, and fast deployment in an emergency response. Versatile Applications – Each pump can be operated independently or in tandem; fit for pumping large volumes of water while fighting industrial and municipal fires, dewatering flooded areas, hazardous vapor mitigation, and many other applications. 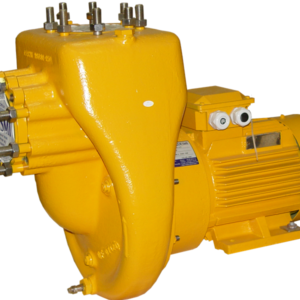 Multi-Use Response Equipment – Optional auxiliary hydraulic outlet connections for powering oil skimmer equipment. This expands emergency response usage of the onboard hydraulic system beyond firefighting, flood control, vapor suppression, or general water movement. Wide Range of Options and Flexibility of Customization – User focused design includes ideas from industrial firefighters for solving specific and challenging application requirements. Compatible with various transportation modes. Large volumes of water are usually the most critical resource in firefighting and many other hazard mitigation operations. However, water is not always readily accessible. This inaccessibility is especially true when the fire pump is greatly elevated above the water level, or when large tidal swings occur. 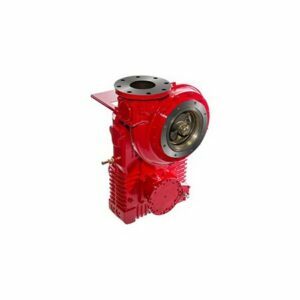 The DEPENDAPOWER Submersible Pump provides the ability to move water from sources where a conventional fire pump is limited by drafting capacity. and hazard control operations. The floating submersible hydraulic pump can lift 8,000 gpm (30,000 Lpm) of water up to 35 ft (10.6 m) from a body of water with a positive discharge pressure to feed boost pumps or transport the water over a long distance through a hose relay. With a maximum vertical lift of over 100 ft (30.5 m) at distances up to 200 ft (60 m) away, the DEPENDAPOWER Submersible Pump helps resolve problems of water accessibility. In addition, the DEPENDAPOWER Submersible Pump, in standalone submersible, or submersible/boost combination, is perfect for dewatering operations in flood zones. The 8,000 gpm (30,000 Lpm) combination pump can easily be reconfigured to move water side by side. 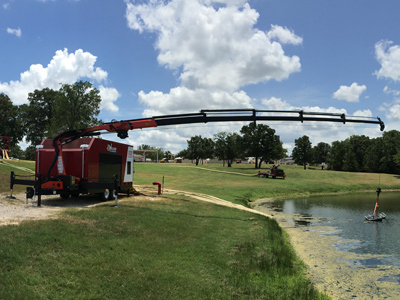 The hydraulic submersible pump can pump up to 8,000 gpm (30,000 Lpm) while the on-board priming system of the boost pump allows for simultaneous open-water pumping of up to 6,000 gpm (22,700 Lpm). At full flow, the single unit delivers up to 14,000 gpm (53,000 Lpm) of flow, setting a new industry standard for moving large volumes of water. The image below shows a standalone 8,000 gpm (30,000 Lpm) submersible package shown with optional bumper pull trailer and PALFINGER* wireless remote control deployment crane. *CATERPILLAR and PALFINGER are trademarks of their respective owners. DEPENDAPOWER, AMBASSADOR, and the product names listed in this material are marks and/or registered marks. Unauthorized use is strictly prohibited.